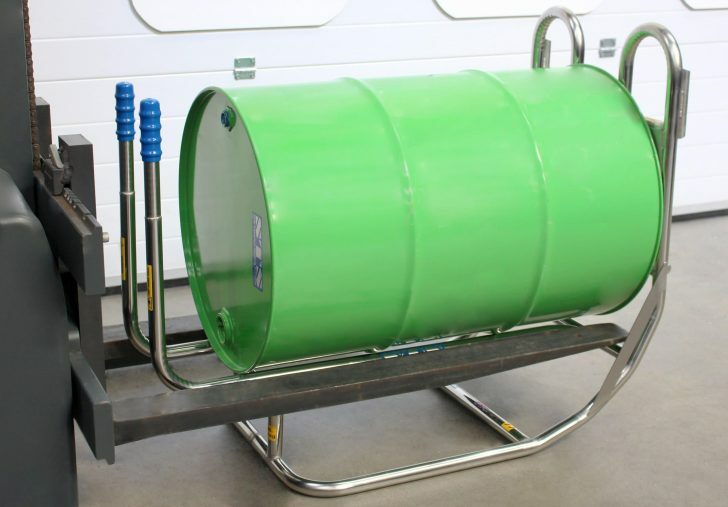 We’ve designed this unique drum cradle to allow you to move 200-litre drums from a vertical to a horizontal position in a safe manner. 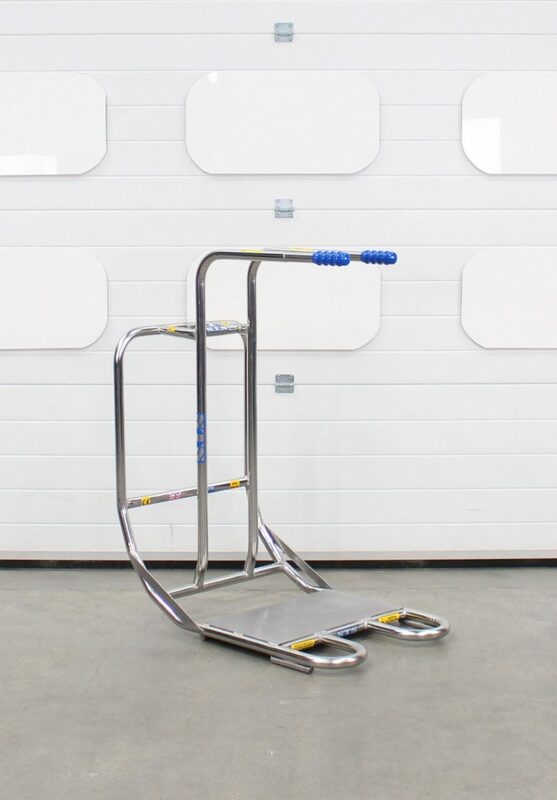 It’s perfect for positioning drums so that a stacker or forklift truck can lift them and place them into racking. Our curved design and ergonomic handle heights minimise the amount of effort required to move and decant drums. You can comfortably orient drums weighing up to 300kg using an input force lower than 25kg. 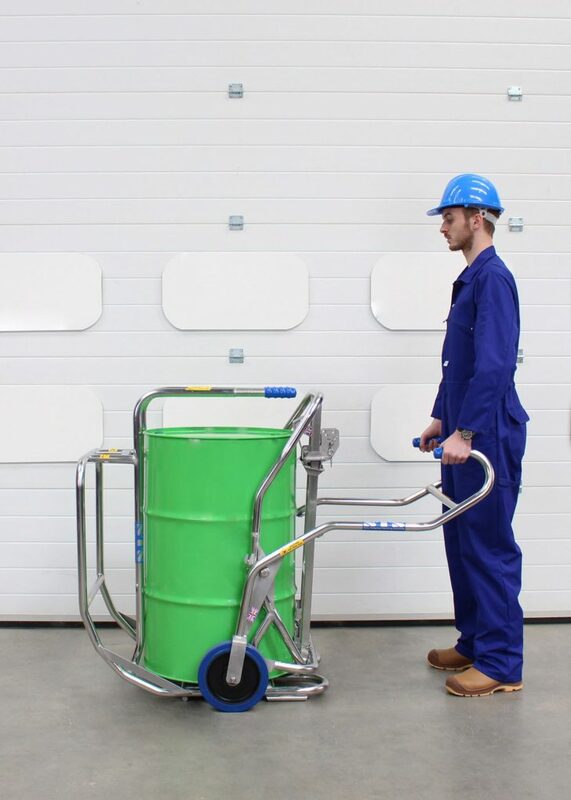 Make sure you use a safe and suitable drum lifter, such as our STS Universal Drum Trolley (pictured) or one of our STS drum depalletisers, to load your drum onto the baseplate. Once you’ve rotated a drum, you can use forked equipment to go underneath the cradle and lift up, removing the drum from the cradle. This is ideal if you need to place drums into storage racking horizontally. We build this drum cradle in full stainless steel, making it particularly suitable for the food, chemical and pharmaceutical industries. Stainless steel is far superior to other materials when it comes to corrosion resistance, and we design all of our units to last. 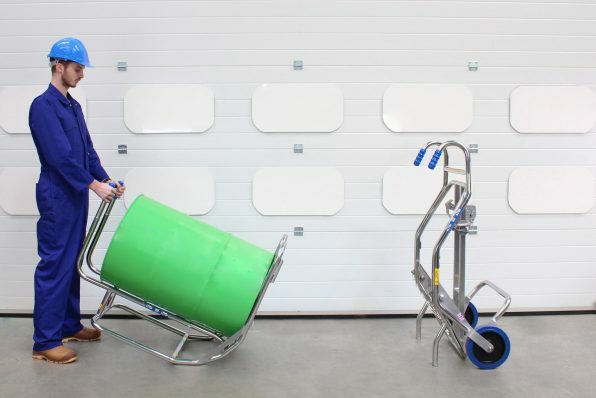 We’ve designed our Drum Rollover Cradle to allow you to handle 200-litre straight-sided drums. 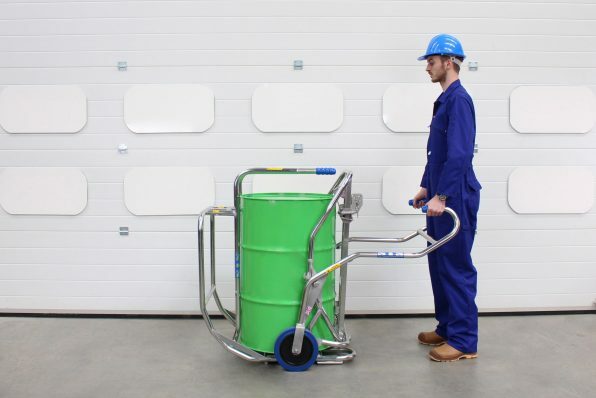 To keep operators safe, it’s important that you only handle 200-litre drums with this product. 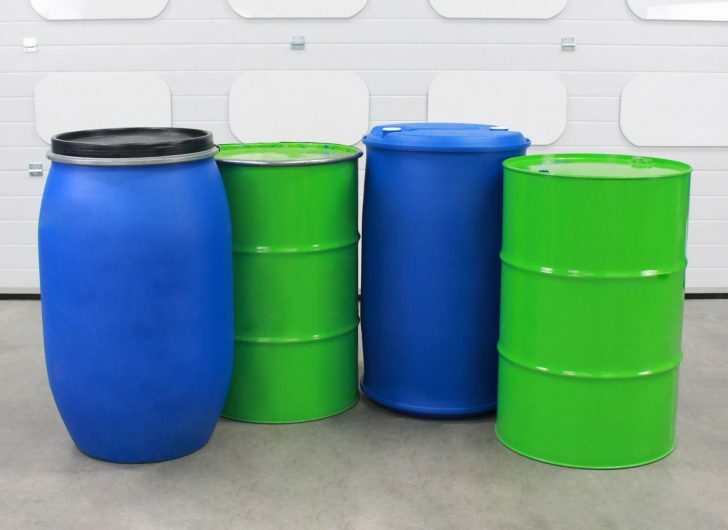 For details on the compatible drum types, see the drum suitability document by clicking the button below. 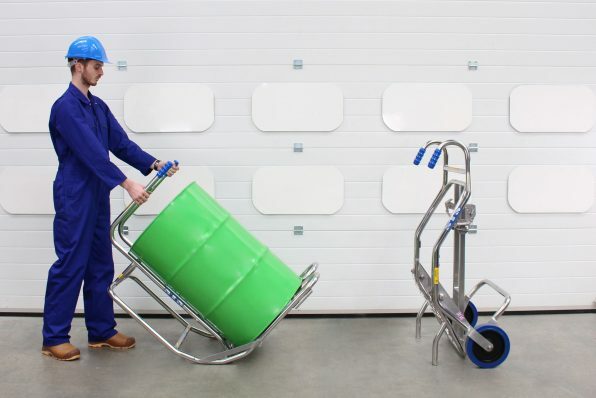 Explosive or potentially explosive atmospheres require operators to use zoned ATEX drum handling equipment. We provide fully-certificated drum stands for use in these hazardous areas. The DCR02-Ex is certified for use in Zone 1, 2, 21 and 22 areas. Each drum cradle is manufactured to ensure electrical continuity, a path to ground is always present. 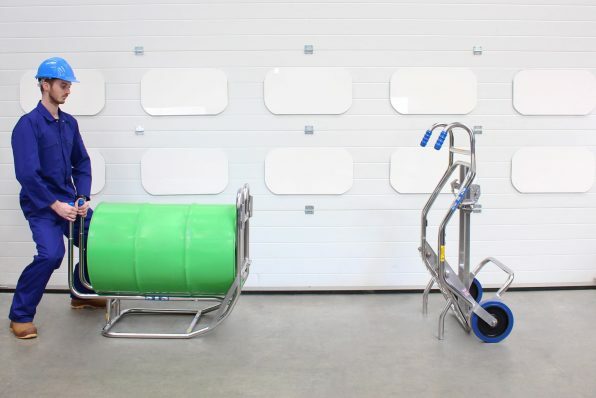 We supply each piece of ATEX drum lifting equipment with a manufacturer’s EU Declaration of Conformity, this demonstrates compliance with the ATEX Directive. 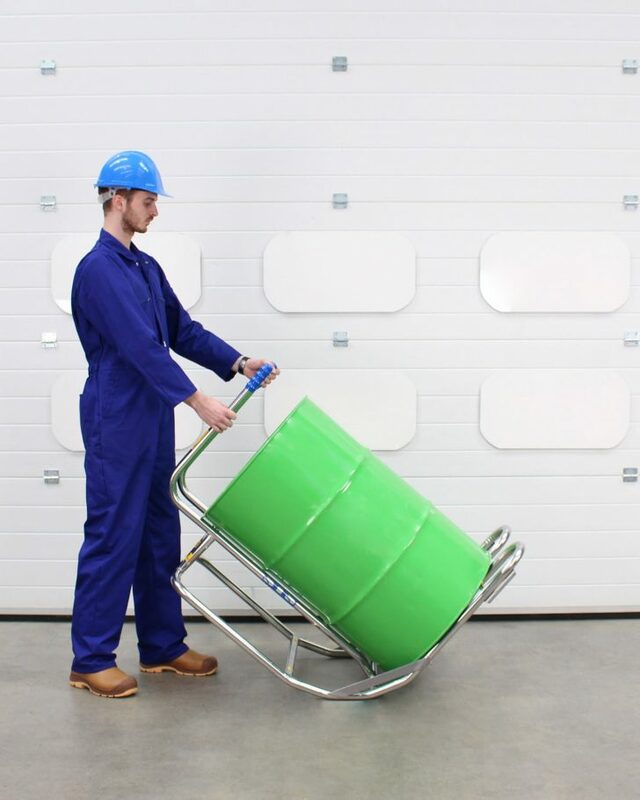 We can build this drum cradle certified to ATEX Directive 2014/34/EU – suitable for use in potentially explosive ATEX Zone 1 environments. 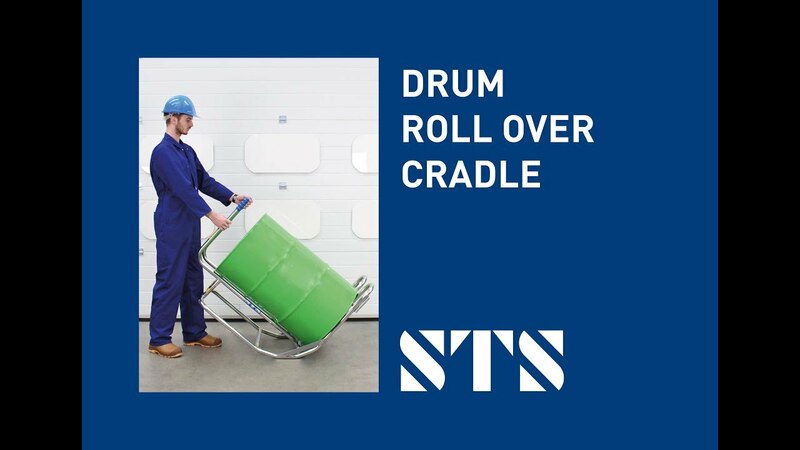 See the full technical specification for our 205L Drum Rollover Cradle for details such as weight, dimensions and load capacity. View the instruction manual for our 205L Drum Rollover Cradle, which details how to safely operate and maintain the unit. Do you have a question for us? Take a look at our FAQ page for answers to common customer queries.